Entries from Digital Intelligence tagged with "msn"
Microsoft has relaunched its flagship portal MSN, and will now rely entirely on third parties for content, with a new look designed to appeal to a growing mobile audience. It seems advertisers have intensely mixed feelings about Google, as the brand has topped a best reputation list of media brands- but was also voted the least pleasurable to work with, in the same poll. Instant messaging pioneer MSN Messenger is finally being switched off after 15 years, as the once popular hangout for teens has been usurped by Skype and mobile chat apps such as WhatsApp, Instagram and Snapchat. Major portals such as MSN and Yahoo are losing their stronghold on consumer attention with many turning to sites specific to their interest, according to new research. The study, from Mediasyndicator commissioned research with YouGov (1,987 UK adults) in order to discover the types of websites consumers visit for content and the environments in which they are most engaged and open to advertising. Microsoft is launching its own news services, MSN News as part of its new re-designed MSN portal. The new-look MSN site will be exclusive for Windows 8 and will be available for Internet Explorer 10 users by the end of October. Microsoft has revamped the homepage for MSN UK, which will start integrating Facebook and Twitter on its main page. The changes will be the first major adjustment since September 2007 and are intended to simplify the website's design to reduce download time. A large high-profile spot on the main page will also have the new MSN Video Player, offering online TV service. "The new homepage is much lighter, much whiter, much shorter [in overall length], much smaller", said Peter Bale, executive producer of MSN UK at Microsoft. With the social networking additions, site visitors can access and update their accounts directly from the main page, intending to create a centralized home for UK internet users. 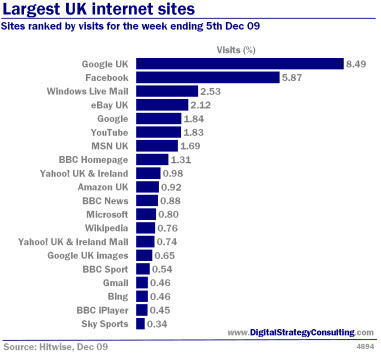 This list features the most popular websites based on UK Internet usage for November 2008, ranked by market share of visits across all Hitwise industries. 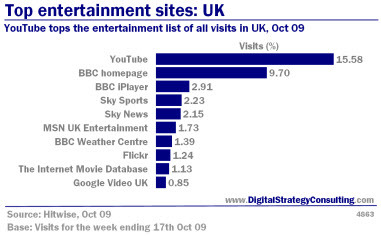 This list features the most popular websites based on UK Internet usage for October 2008, ranked by market share of visits across all Hitwise industries. 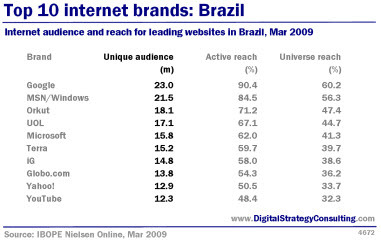 Note: This list features the most popular websites based on UK Internet usage for June 2008, ranked by market share of visits across all Hitwise industries. 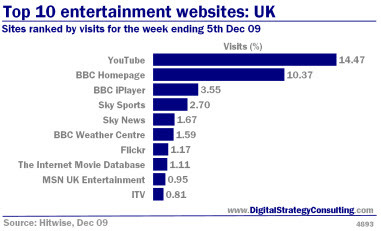 This list features the most popular websites based on UK Internet usage for February 2007, ranked by market share of visits across all Hitwise industries.